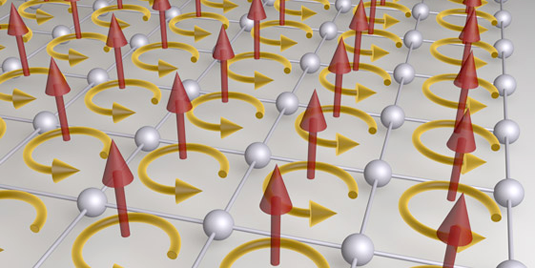 A team of scientists around LMU Professor Immanuel Bloch developed a new method to simulate a two-dimensional crystalline structure in large magnetic fields using ultracold atoms in optical lattices. Cyclotron orbits of atoms exposed to extremely strong effective magnetic fields in specially engineered light crystals. The effective field strengths realized in the experiment correspond to tens of thousands of Tesla magnetic field strength applied to a real material. In the experiment the celebrated Hofstadter-Harper as well as the Quantum Spin Hall Hamiltonian could thereby be implemented. After more than 40 years of intense research, experimental physicists still seek to explore the rich behaviour of electrons confined to a two-dimensional crystalline structure exposed to large magnetic fields. Now a team of scientists around Professor Immanuel Bloch (Chair for Experimental Physics at the Ludwig-Maximilians-Universität Munich and Director at MPQ) in collaboration with the theoretical physicist Dr. Belén Paredes (CSIC/UAM Madrid) developed a new experimental method to simulate these systems using a crystal made of neutral atoms and laser light. In such artificial quantum matter, the atoms could be exposed to a uniform effective magnetic field several thousand times stronger than in typical condensed matter systems.